Seven months ago I completed my commentary of Mattogno’s reponse to my 2006 article about Mattogno’s considerations regarding the mass graves at Belzec extermination camp. Yet Mattogno’s response to this commentary hasn’t progressed beyond the first two sections, which he addressed in two articles I mentioned in a previous blog. These two articles, moreover, don’t seem to have been translated into English and/or published on any of the major "Revisionist" dump sites. Unless I missed something, they are only available on Italian blogsites including one "dedicated to the studies of Carlo Mattogno", the presentation of which is sometimes reminiscent of the multi-sized/multi-colored hysteria of Greg Gerdes’ website, and which is also frequented by a character who calls himself (or herself) "hcn" (obviously an allusion to the chemical formula of hydrogen cyanide, the active ingredient of Zyklon B) and indulges in proclaiming, at the start of some of Mattogno’s articles, how fond he or she is of kids with blue eyes and blond hair. Such is the company that Carlo Mattogno keeps – which is not surprising, considering what we have seen elsewhere from the flagship of "Revisionism". Why didn’t Mattogno continue responding to my deconstruction of his "risposta"? Did he run out of "Revisionist" arguments and rhetoric? Did he realize that he has been thrashed beyond redemption? Did he get cold feet and thus decide to attack opponents less likely to hit back, if only because they consider it below their standing to spend time responding to a "Revisionist" charlatan, even if his name is Mattogno? Whatever. Having waited half a year (after returning from my summer vacations last year) for Mattogno to continue responding to my rejoinder, or at least for his knee-jerk reactions in early July 2009 to show up somewhere in English translation, I’ve decided to wait no longer. Not because I’m keen for Mattogno’s attention or think he made important points, but because I’m in the habit of leaving no "Revisionist" BS addressed at me unresponded, and of course also because I’m as fond as my fellow bloggers of exposing the coryphée of "Revisionism"as just another "Revisionist" hate propagandist. In the following blogs I shall therefore comment Mattogno’s blogs LE ULTERIORI CONTROVERSIE OLOCAUSTICHE DI ROBERTO MUEHLENKAMP Parte I and LE ULTERIORI CONTROVERSIE OLOCAUSTICHE DI ROBERTO MUEHLENKAMP Parte II. Belzec Mass Graves and Archaeology: My Response to Carlo Mattogno (5,2), last section with links to previous sections. Original Italian version; English translation. Carlo Mattogno on Belzec Archaeological Research, Part 1 with links to following parts. Belzec Mass Graves and Archaeology: My Response to Carlo Mattogno (1); Belzec Mass Graves and Archaeology: My Response to Carlo Mattogno (2). E.g. LA "REPUBBLICA" DEL DELIRIO O I TEPPISTI DELLA DISINFORMAZIONE; IL CAMPO DI CHELMNO TRA STORIA E PROPAGANDA. Now called "The National Association of Forensic Historians", whatever "forensic historians" are supposed to be. E.g. LE ULTERIORI CONTROVERSIE OLOCAUSTICHE DI ROBERTO MUEHLENKAMP – Parte I and LE ULTERIORI CONTROVERSIE OLOCAUSTICHE DI ROBERTO MUEHLENKAMP – Parte II. Comments around the photo of a blond, blue-eyed child translate as follows: The Jew levi primo doesn’t like blue eyes and blond hair! 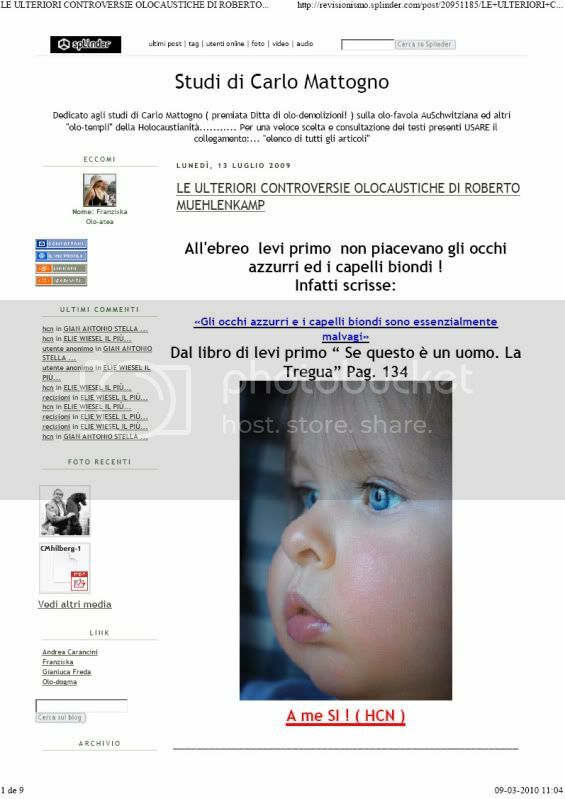 In fact he wrote: «Blue eyes and blond hair are essentially evil.» From the book of levi primo "Se questo è um uomo. La Tregua" page 134. [photo] I like them! (HCN). Publishing this photo is possibly a violation of the child’s personality rights, and if the child were mine I’d take appropriate legal action. If the child’s photograph for propaganda purposes was authorized by persons in charge of the child, that speaks volumes about such persons. Thus Dr. Joachim Neander calls Mattogno in the blog Dr. Joachim Neander responds to Carlo Mattogno regarding the September 1941 gassing in Block 11 of Auschwitz.